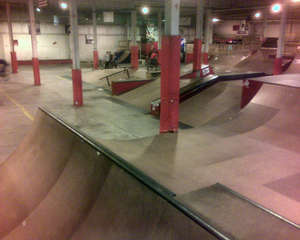 I went to the Skaters Edge skate park last night with some friends. JRA Cycles in meffa rented the place out. It was so much fun. It was my first indoor skate park ever, and my first real skate park. I brought my mountain bike with my street tires, which worked awesome. I just wish our session lasted longer than 3 hours.